W atches A nd B eyond. 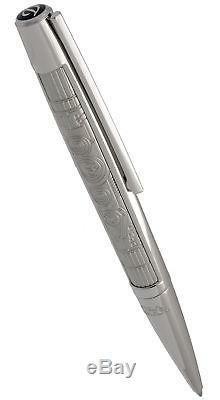 Dupont Défi Star Wars Palladium Medium Ballpoint Pen Black Ink Medium Limited Edition. The highest-performing and most precise pen of its generation. Designed as a truly sophisticated object, like a fighter jet, its dynamic, vigorous and elegant design makes it both contemporary and masculine at the same time. Its innovative and unique construction combines a high precision injected metal frame, finished in palladium, and a carbon fiber body. Never before has a pen provided you with such an intense and rapid gliding sensation. The Défi pen will delight you with its clear, precise and fluid writing. Designed on the basis of the Défi pen model. The Defi X-wing ballpoint writing instrument, whose streamlined shape is inspired by the aeronautical industry, is the ideal model to evoke the Rebel Alliance fighters' agility in flight. Its gleaming palladium finish is engraved with a pattern which perfectly replicates the plan of the X-wing fighter's generator. 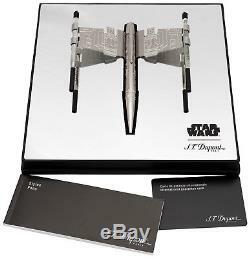 The presentation box for the Defi X-wing ballpoint pen is stamped with the Star Wars logo and recreates the appearance of the fighter through the clever use of symmetry and a mirror. Défi X-wing Palladium engraved pen. Medium ballpoint - Black ink. Dupont black ballpoint pen refills. The length of the pen is 5.5. The diameter of the pen is 13.5 mm. As all of our pens, this S.
Dupont Défi Star Wars Ballpoint pen is BRAND NEW, and comes in its original packaging! Material: Carbon Fiber Body Finished in Palladium. Length of Pen: 5.5. WatchesAndBeyond offers a broad selection of major Brand Name Watches. Our staff of skilled professionals strive to provide each customer with unsurpassed service. Our sincere commitment to customer service, superb selection and value, has been making a pleasant experience to our customers and has been bringing them back time after time since 1999. As Wholesalers, we have the opportunity to provide you with brand name watches at prices far lower than any Authorized Dealer can give you. While our watches are guaranteed to be 100% authentic, since we are not Authorized Distributors for many of the brands we sell, we are free to sell at a price that is mutually beneficial for us and our customers alike. "Authorized" dealers are required to sell watches within the manufacturers' pricing guidelines. Please note: We are open and ready to take your call for extended hours during peak shopping seasons. 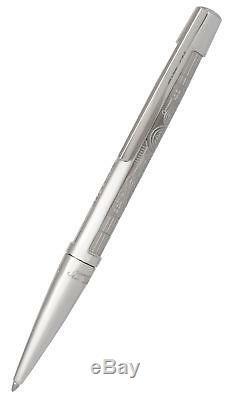 Dupont Defi Star Wars Palladium Medium Ballpoint Pen Limited Edition 405811" is in sale since Thursday, May 31, 2018. This item is in the category "Collectibles\Pens & Writing Instruments\Pens\Ballpoint Pens\S. The seller is "watchesandbeyond" and is located in New York, New York. This item can be shipped worldwide.